Ambassador Eleni Tsakopoulos Kounalakis, who quickly becomes “Madam Ambassador,” starts her memoir with a bang. Shortly after starting her post as the first Greek-American to serve as a U.S. ambassador, she is invited to participate in a wild boar hunt in the countryside near Budapest, Hungary. She is—not surprisingly—the only woman in the hunting party; she’s also the only hunter of the day to successfully bring down a wild boar. This political memoir of her time as an American ambassador in Budapest from 2010 to 2013 has moments of insight, humor, and forays into Ambassador Kounalakis’s personal life, but there is not nearly enough of this sort of thing. The text is bogged down and almost brought to a halt with a vast amount of political and historical retelling. Although the inclusion of these facts was likely necessary and for the most part interesting, this memoir might have shone brightly if all this had been pared down. Feelings and fears and faux pas along with sights and sounds and smells are the building blocks to excellent memoir writing. Ambassador Kounalakis captures these elements extremely well in her first chapter. If only she had carried that magic throughout the book. Without being overly cocky, she narrates those moments as an ambassador that made her most proud while not being the least bit shy about sharing the moments that just didn’t go so well. She also does a fine job painting the picture of present-day Hungary and the attitudes of its people as they transition from post-communist to a democratic society. 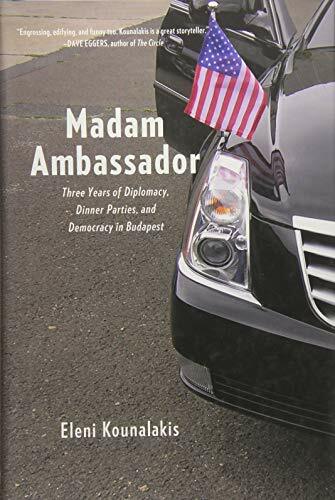 At the end of the day, Madam Ambassador lacks the depth to be all that memorable, but is most definitely a worthwhile read for those interested in a cursory history of Hungary, diplomacy, and a peek into the life of a very nice woman and an exceptional ambassador.